Desk Compass Clock - Right Place Right Time! Optional Engraving. 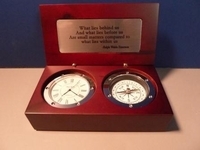 Home > Custom Engraved DESK Compasses > Desk Compass Clock - Right Place Right Time! Optional Engraving. 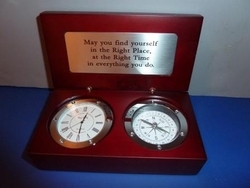 Desk Clock and Compass: A gift for someone who is in the right place at the right time! Optional Engraving available. A compass and clock desk gift for someone who always seems to be in the right place at the right time! This desk compass and clock are set side by side in a lovely dark cherry wooden case. Clock and compass are trimmed with a highly polished silver plate. A personal message can be added to the interior plate. A perfect compliment to the desk at 6"X 4"X 2" with lid closed. Add an optional personal inscription or message to this desk compass. The plate will be engraved and placed on the interior of the compass. (TYPE your inscription in the boxes below). We recommend no more than 35 characters on a line. Plate engraving: $5.00 per line.